BRACKNELL, UK. 13th September 2016 Designed by Panasonic Global Design Solutions following close consultation with leading industry manufacturers, Panasonic has launched its next generation in-line testing solution for the automotive industry at Automechanika in Frankfurt, Germany. The Panasonic Automotive Mobile Test Solution (AMTS) combines the technology requested by the automotive industry for efficient vehicle production and initialisation with enterprise features for seamless integration into a corporate IT environment. The device has been developed with both ease of use and automotive production processes at the forefront of the design. 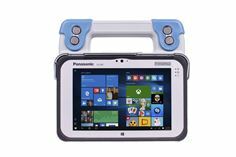 The AMTS, based on the market-leading fully rugged Panasonic Toughpad FZ-M1 tablet, incorporates a 7 inch capacitive multi-touchscreen display, an NFC contactless card reader, integrated high power infrared, and a 2D barcode reader which are situated within the specially designed handle of the AMTS which aids mobility in the production environment. The AMTS is built with the connectivity requirements of the automotive manufacturers in mind with dual rugged connectors that allow USB communication plus protected ODB in-vehicle charging from a VCI device. This means that the solution is ergonomic for both left and right hand drive vehicles. To meet the processing and efficiency requirements for automotive testing, the Panasonic AMTS is powered by the Intel® Core™ m5-6Y57 vPro processor (1.1GHz up to 2.8 GHz with Intel® Turbo Boost Technology and a 4MB Intel cache) and Intel® HD graphics. It comes with the latest Windows 10 Pro operating system, which can be downgraded to Windows 7 Professional. For storage there is a 128GB Solid State Drive with 256GB optional. For communications, the AMTS is equipped with Bluetooth™ v4.1+EDR Class 1 and an Intel Dual Band Wireless-AC 8260 WLAN capability with optional 4G mobile broadband (Gobi 5000, compatible to 3G) connectivity. The Panasonic AMTS will be available from October 2016 and is priced from £3,490.